Dominance in college football could be defined as winning 50 percent of the conference titles. 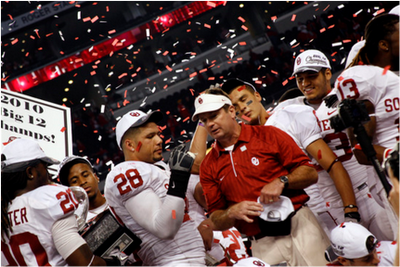 Since the beginning of the Bob Stoops Era, the Sooners have won seven Big 12 championships, including four of the last five. Stoops is 84-17 in the Big 12 and 7-1 all-time in the Big 12 conference championship game. The 15-year history of the Big 12 has brought many gorgeous statistics, prime-time players and Hall of Fame coaches, but Stoops’ staggering number of conference titles has to be the most stunning. Bob Stoops gave the rest of the Big 12’s football coaches a three-year head start to rack up Big 12 championships. By 2000, Stoops already had won a Big 12 title and a BCS national championship. What coaches Bill Snyder, Mack Brown and John Blake couldn’t do in the years prior to Stoops’ arrival in Norman, Stoops did in only his second year as the head coach at OU. That’s not my opinion, just a fact — the man can coach some pigskin. A case can be made that this was Stoops’ best coaching performance of his 12-year reign as OU’s football czar. After Sooner great Sam Bradford’s shoulder exploded like a TNT-charged piñata during an early season showdown with BYU 2009, sophomore quarterback Landry Jones was forced into the role. I use the word “force” deliberately because that is exactly how Jones looked throughout the rest of that season — ridged, tight, stiff; a square peg being hammered into a round hole. Stoops had some work to do. Though Jones showed flashes of brilliance in the latter half of the 2009 season, no one would have predicted he would grow into the precision passer he has. Jones looked, at times, unflappable when he was sporting the crimson and cream at Oklahoma Memorial Stadium. And true to that form, he is undefeated in every home game he has started as the Sooner’s quarterback. But on the road ¬— where the crowds are hostile and TV lights seem brightest — Jones struggled for much of the year. Leave it to Stoops not to lose faith in his quarterback; to keep coaching him up and whispering words of courage, bravery and valor into the ear of the one player he knew he would need in OU’s last two games of the 2010 season. In the Bedlam game, when the Sooners could only muster 2.7 yards per carry on the ground, Jones exemplified the attributes of the great OU field generals who have come before him. He passed for a 468 yards and four touchdowns against a team yours truly thought would demolish the Sooners at T. Boone Pickens Stadium. Bedlam turned out to be a dress rehearsal, though. The last Big 12 Conference Championship game — for what we can only guess will be a very long time — pitted OU against the only team in the North that Sooner fans love to hate: Nebraska. As fate would have it, the contest between the Cornhuskers and Sooners would be the last great installment in the 98-year history of this rivalry. Not since Tom Osborne and Barry Switzer were coaching on either side of this rivalry were the stakes so high. But Stoops knew what he had. He knew what his team was capable of , and — most importantly — the kind of leader and passer his quarterback has grown to become. The Sooners beat a better, more talented Nebraska football team on Saturday. Maybe they beat Nebraska because they wanted it more. Maybe it was because Mr. Momentum suddenly became a Sooner fan. But I believe it was because of one man — Bob Stoops — who outdid himself this season to get his team this far. And don’t let anyone tell you differently.